Out of the ashes of Jerusalem's destruction and the disaster that befell God's people because of their repeated disobedience comes this reminder of truth. 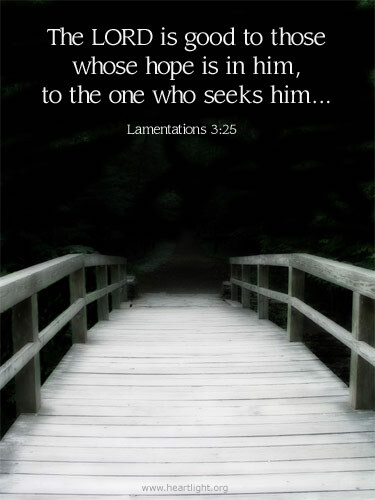 Those who wait patiently, who hope fervently, in the LORD will find what their soul most needs! Give me patience and faith, O God, for the times when life is hard and everything seems to go against me. I believe that you are good to those who persevere, waiting patiently in hope for your mighty deliverance. Dear Father, please give me such strength because I not only want to receive your blessing, but I also want to bring you honor. In the name of your Son, Jesus, I pray. Amen.